A non-cheerful backdrop for the speaker’s talk. Encountering doom and gloom on the economic front. A backdrop that also provides valuable context for some aspects of the legislative audit work of the Office of the Auditor General of Canada. What Canadians are worrying about. The demand for accountability from their federal government. Ottawa’s response to the global recession. Illustrating the importance of audit and accountability. Holding the federal government to account for the Economic Action Plan. How the speaker’s office works and her role as Auditor General of Canada. Some statistics. Some characteristics and mandates of the office. Carrying out two types of audits: financial and performance. Some details on each. Auditing the Economic Action Plan. Parliamentary and public expectations that the $40 billion the federal government is spending under the plan will be managed well. The further scope of the audit work. Criteria to be considered in future audit work around the Economic Action Plan. Program design. The need for the federal government to work very closely with the provinces, territories, and communities. Identifying how to define success. The need for clear rules and how the speaker’s Office will support the process. Some concluding remarks. The yearly Status Reports. Some personal comments on the Office. Janice Madon: Senior Vice-President and Chief Auditor, Manulife Financial. Adjectives like fearless, truth fighter, no-nonsense, fair-minded are not adjectives usually associated with accountants, no offence meant to any present in our audience today. Wikipedia says that she is debatably history’s most popular government accountant, due in part no doubt to her role in unveiling the Sponsorship Scandal—a scandal where people actually were held to account for their actions. And Canada’s admiration for Sheila Fraser was shown when she was named the 66th Greatest Canadian of all time in a CBC poll. Again—pretty high praise for an accountant. To borrow a hockey analogy (as rumour has it that we’re in the hunt for the Stanley Cup in some parts of this country) she’s tough in the corners, regardless of who is in power. She remains accountable only to Canadians and for that we are grateful to have Ms. Fraser in our corner, fighting those battles. The phrase, “I’m having a Sheila Fraser moment,” has entered the lexicon and is used upon discovering that what one promised to do does not measure up to what one actually did. No one has ever upheld this position or held the government to account in this way. She has set the new standard for future auditor generals. And I have to add, for what it’s worth, she is the first woman to hold the position. Please join me in welcoming Sheila Fraser to our podium today. 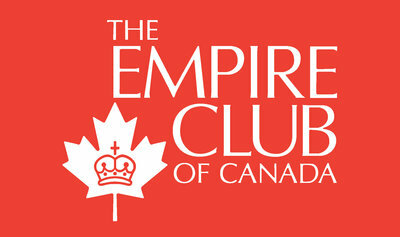 It’s a pleasure to address this meeting of the Empire Club of Canada, and I thank you for inviting me to join you. It’s also a tremendous honour. Given the many prominent Canadian men and women who have participated in this respected forum, I find myself in very distinguished company indeed. The world and Canadian economies do not form a very cheerful backdrop for my talk today. Every time we open a newspaper, or tune in to radio, TV or online newscasts, we encounter doom and gloom on the economic front—grim forecasts, reports of company closures, mounting investment losses, and a growing list of layoffs. But it’s a backdrop that provides valuable context for some aspects of the legislative audit work of the Office of the Auditor General of Canada. Canadians are worried about their jobs. They’re worried about being able to maintain their standard of living and assure their families’ economic well-being. And, increasingly, they’re worried about how governments are spending their tax dollars. In today’s economic climate, Canadians are demanding accountability from their federal government. Like other national governments, Ottawa has responded to the global recession by introducing a package of spending measures aimed at stimulating the Canadian economy. On January 27, the federal government tabled its 2009 budget and Canada’s Economic Action Plan. Under the plan, it will provide almost $40 billion in cash support, equivalent to 2.5 per cent of our GDP, to the Canadian economy over the next two years. Today, I want to illustrate the importance of audit and accountability by speaking about our role in helping Parliament hold the federal government to account for its recently announced Economic Action Plan. Before I do, however, let me tell you something about our office and how it works. Role of the Office of the Auditor General of Canada The first independent auditor general of Canada was appointed in 1878. Today, our office has an annual budget of $82 million and a staff of more than 625. While the focus of the office has evolved over the past 131 years, one thing has remained constant: We continue to report to Parliament on how the federal government spends taxpayers’ money. Independent from government, our office reports to Parliament, and our reports are tabled in the House of Commons. Members of Parliament are responsible for holding the government accountable for its actions. Our role is to provide them with independent, fact-based and reliable information, and assurance to help them do their job. Through our audits and recommendations, we also contribute to improved government management. We audit federal departments and agencies, and most Crown corporations. We also audit Canada’s three territorial governments and their related agencies. And, we are currently the auditor of a UN agency, the International Labour Organization. Although there are some variations, we basically carry out two types of audits: financial audits and performance audits. On the financial auditing side, we examine the summary financial statements of the federal government and of Canada’s three territories. We also provide audit opinions on the financial statements of over 130 federal and territorial organizations, including Crown corporations. Our opinion indicates whether the financial statements are fairly presented in accordance with generally accepted accounting principles for governments. Our performance audits, meanwhile, look at the government’s management practices, controls and reporting systems, with a focus on results. We seek to determine whether government programs are being managed with due regard for economy, efficiency and environmental impact, and whether there are measures in place to determine if the programs are achieving their intended purpose. Each year, we produce between 25 and 30 performance audits. We do not comment on government policy. We do not judge whether programs are delivering value for money or whether policy choices are appropriate. That is Parliament’s job. Rather, we tell parliamentarians how well government programs are being run and whether they are achieving their intended results. We also have a specific environment and sustainable development mandate. In 1995, Parliament created the position of Commissioner of the Environment and Sustainable Development within our office. As part of our performance audit work, the commissioner has a team that audits environmental and sustainable development issues, monitors how well the federal government is meeting its commitments to sustainable development, and administers an environmental petitions process. This, then, is the framework for our upcoming audit work on expenditures under the Economic Action Plan. Our audit role reflects parliamentary and public expectations that the $40 billion the federal government is spending under the plan will be managed well, and used for the purposes intended. Certain initiatives announced by the government will be covered in our financial audits for the Public Accounts of Canada and Crown corporations. For example, the $4-billion auto industry bailout, and authority for the Canada Mortgage and Housing Corporation to purchase up to $125 billion of insured mortgages. But the scope of our audit work related to the Economic Action Plan will go well beyond that. I appreciate that government managers will face challenges in implementing the plan. They will need to balance the government’s wish to move quickly with the requirement to exercise due care. This will require a sound analysis of risk, and appropriate delivery mechanisms commensurate with those risks. The criteria I outlined are not new or unique. In fact, they are the same ones that are used to audit any government program. Among them are appropriate planning, risk management, management systems and practices, well-defined eligibility and selection criteria, and compliance with existing legislation. However, a few key steps are necessary to ensure that programs under the Economic Action Plan are appropriately planned and monitored. First, there is the question of program design—notably the degree of flexibility and the specificity of eligibility criteria. Criteria need to be established up front and need to be clear, well-defined, well-documented, commonly understood, and consistently applied to ensure that only eligible projects are funded. Since most expenditures will likely take the form of transfers to other governments or corporations, the federal government must adhere to its own Policy on Transfer Payments. The choice of transfer mechanism, and the degree to which conditions are imposed, should be appropriate to the associated risks. Second, the co-ordination and integration of activities will present challenges both within and across levels of government. The federal government will have to work very closely with the provinces, territories, and communities. It must be able to work effectively with these partners to provide timely and useful information for decision making. Finally, to achieve the intended outcome, the government needs to identify at an early stage how it defines success, and the kinds of information needed to measure and report on the impact the stimulus spending has had; that is, what it achieved. In all our audits, we base our criteria on the government’s own rules, as set out in legislation or in administrative policies. As I have already mentioned, it’s the government’s responsibility to spell out how programs will be run, and to identify expected outcomes and results. I recognize that, in response to some of our past audits, the government introduced more rules, procedures and processes. We have long argued that it doesn’t need more rules; it simply needs to adhere to those that already exist. In some cases—for example, where the risks are relatively low or timing is important—it may actually be best to have fewer and clearer rules. The government does, however, need to ensure that the rules in place are respected. That said, we are not against the government changing some rules, procedures and processes if there is a good reason. Of course, if the rules change, we would expect the government to document them clearly, and to tell managers what they can and cannot do. In this way, the Economic Action Plan represents an opportunity for the government to review its processes and rules, and build some needed efficiency into its operations. My office is pleased to support this process. I believe the work of auditors serves Canada well. While it is the job of my office to be critical, ultimately I believe we have a constructive role to play. We help maintain the confidence of Canadians in their government. In so doing, we help build stronger public institutions, a better country, and a healthier democratic society. We view our audits as learning tools. And while we do point out where things go wrong, we also try to suggest improvements and promote good management practices. In the end, what counts is acknowledging mistakes and inefficiencies, and then putting a process in place to fix them. This is what we try to encourage. Our yearly Status Reports show that government management does improve. Status reports are a way for us to find out—and for parliamentarians to assess—whether government organizations are meeting commitments they made in response to the recommendations we made in previous audits. Our latest Status Report was tabled on March 31, and I was pleased to note that of the seven topics revisited this year, we found satisfactory progress in five. I feel very privileged to hold this office. It gives me an opportunity to try to make a difference in the lives of Canadians. In closing, I want to again emphasize that it’s not the job of the Office of the Auditor General of Canada to comment on policy choices. Our role vis-à-vis the Economic Action Plan will be to tell Parliament how well its decisions were implemented with respect to the government’s stimulus package.